Championship leaders Hull City could be without captain Michael Dawson for up to a month with a hamstring injury. 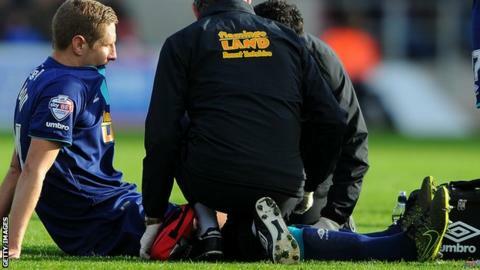 The former Tottenham skipper had to be taken off after just 37 minutes of the 1-1 draw at Bristol City on Saturday. Dawson has been key during Hull's 11-match unbeaten run which has taken them to the top of the table. The club have confirmed the 32-year-old has sustained a grade two tear, with recovery expected to be between three and four weeks. Dawson was already due to miss Friday's match against Derby through suspension, which will also keep out left-back Andrew Robertson. Manager Steve Bruce also has injury concerns over midfielder David Meyler, who faces eight weeks out because of a knee injury, while striker Adama Diomande and midfielder Robert Snodgrass have yet to feature this season.